A changing climate and rapid urbanisation demand a rethink in how we build and run towns and cities. Kala Vairavamoorthy, Nathanial Matthews and Paul Brown set out the aims and thinking behind key initiatives to promote and implement resilience. Today, cities all over the world are confronted with a range of dynamic regional and global pressures, including climate change, population growth and the deterioration of urban infrastructure. Against a backdrop of rapid global population increase, urban areas will swell by an estimated 2.5 billion people by 2050. Almost 90% of this increase will occur in Asia and Africa. People living in these cities and towns, especially in low-income countries, face chronic and acute threats of flooding, extreme temperatures, and waterborne diseases caused by polluted water and poor sanitation. These risks are particularly devastating in dense urban areas, where large numbers have flocked and local building regulations often go unenforced. Such stressors are amplified by increasingly frequent and extreme events caused by a rapidly changing climate. How we navigate this dangerous period of volatility will have major impacts on millions of people – many of §them vulnerable – and on the critical ecosystems that underpin the health of our urban economies and societies. The Rockefeller Foundation, in its 100 Resilient Cities programme, defines urban resilience as “the capacity of individuals, communities, institutions, businesses, and systems within a city to survive, adapt and grow, no matter what kinds of chronic stresses and acute shocks they experience”. This highlights some essential concepts. Resilience is more than a characteristic of the technology and infrastructure systems in an urban environment; it is based on the collective capacity of people, institutions, commerce and infrastructure to respond, adapt and transform in the face of uncertainty. The unpredictable frequency and intensity of extreme weather is amplifying the acute shocks that threaten lives and property, and disrupt supply chains that provide cities with water, food and energy. At the same time, the chronic stresses inflicted by growing inequality and accelerating urban migration are exceeding the carrying capacity of institutions and infrastructure. Ecosystem degradation is further diminishing the natural buffering capacity that once provided a myriad of ecosystems services, including the partial shelter for communities from chronic and acute flooding and coastal storms. Helping cities increase their resilience will require a multi-level systems approach addressing collaboration and partnerships among social, political and economic institutions in all realms of urban life. It will depend, among other things, on new tools and approaches, including robust decision-making, emergency preparedness and developing infrastructure that can function in spite of increasing climate extremes, bouncing back rapidly when its functions are impaired and creating space for cities to transform and thrive under increasingly uncertain climatic conditions. Developing resilient infrastructure will be challenging. It asks planners and engineers to acknowledge that, in addition to the basic expectation of reliability under normal conditions, there is a need for it to survive and bounce back from extreme events that exceed design conditions. The ability to rapidly restore infrastructure to working order will be as important as preventing its failure in the first place. This means rethinking practices and design principles that are currently deeply embedded. The International Water Association’s (IWA) Principles for Water-Wise Cities aim to offer a holistic systems approach to assessing the sustainability of water management in cities: water services, urban design, basin management and people working together are four interconnected systems. They also aim to help urban leaders and communities develop and implement resilient urban water institutions and systems. The ultimate goal of the principles is to encourage collaborative action, underpinned by a shared vision among relevant stakeholders – bringing people together for resilient city planning. This is further developed in the IWA Action Agenda for Basin-Connected Cities, which suggests pathways for action that urban stakeholders can take to improve the resilience of their surrounding watersheds. The Global Resilience Partnership (GRP) of more than 30 public and private sector organisations has also developed a series of principles to guide resilience approaches. These focus on inclusive decision-making, the importance of healthy ecosystems, and putting people and communities – especially women and marginalised groups – at the centre of decisions, and empowering them to help develop equitable and sustainable solutions. The IWA and GRP principles recognise the need for creativity and innovation in the area of flexible urban water systems that are robust, adaptable and resilient. These systems will be characterised by their ability to cope safely with uncertainties and, so, will be able to adapt to new, different or changing requirements. New techniques such as real-options analysis acknowledge the value of being able to expand, downsize or repurpose infrastructure investments rapidly. The latest process technologies are enabling more modular (decentralised) approaches to urban water management that give internal degrees of freedom, allowing many combinations to be considered, so flexibility can be optimised over time. These principles recognise the interconnectedness of water systems through a more ‘water sensitive’ urban design approach that seeks to enhance resilience through the integration of urban design and the built environment with the management, protection and conservation of water. In contrast to traditional development models that seek to optimise the individual components of isolated systems, resilience models are designed as complex, adaptive systems that can absorb unexpected disturbance while retaining their basic structure and functionality. Resilience thinking uses science, planning, and stakeholder participation to discover flexible urban forms that increase the health and wellbeing of communities. More than simply improving the performance of the component parts of the built environment, change is needed at a system-wide level. For engineers approaching the challenge of contributing to urban resilience, it is critical to remember that strengthening communities of people is as important as designing resilient infrastructure to protect them. Building strong governance processes, participatory decision-making, and robust social networks can enable cities to survive, adapt and thrive in the face of an uncertain future and more frequent extreme events. Recently, GRP and IWA joined a diverse set of partners at the Rockefeller Bellagio Center in Italy for a high-level workshop on the City Water Resilience Framework (CWRF), funded, in part, by a grant from The Rockefeller Foundation. The objective was to review and endorse the tools resulting from the research and development phase of the CWRF, which is led by built environment consultancy Arup. ● Generate and appraise interventions that yield greater resilience for the city water basin in question. ● Important interdependencies exist between the city, the water system and other systems (such as energy, food supply and communications), which affect the resilience of the city. 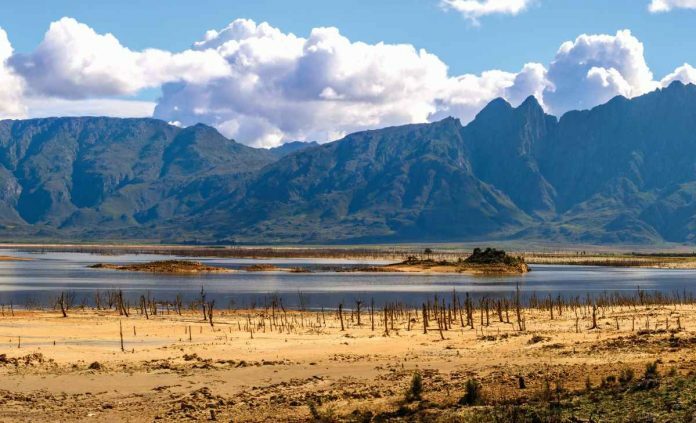 Cape Town – a city in the news recently because of water issues – has initiated dramatic behaviour changes across its populace to reduce the impacts of a prolonged drought. The CWRF worked with the city council and the Cape Town resilience officer to identify the shocks and stresses to which the city was vulnerable. It identified these in the context of how Cape Town is situated within the water basin. Critically, the analysis looked at how water was used within the basins that feed the city, thereby gauging the resilience of the system rather than examining the city itself. The CWRF interviewed stakeholders from Cape Town to determine local perspectives on the resilience of the urban water system. These generated a picture of key water shocks and stresses, and what helped or hindered residents in dealing with them. Key issues that emerged included effective regulation of water quality and quantity, education on resilience issues, and better policies to minimise risks to vulnerable communities. The systems approaches employed by IWA, GRP and CWRF are critical to developing resilience responses. They identify the root causes of complex development challenges and how these can be addressed within the political, economic, ecological, and social systems in which they exist. Technology breakthroughs and innovative designs need to be coupled with comprehensive system changes to the urban processes, institutions and regulations that shape our cities. To build its water resilience, Cape Town implemented demand management mechanisms instituted by the city administration, including advanced pressure management and water restrictions. These helped reduce water consumption by more than 50% compared with pre-drought levels. They also identified key points of exposure to reduce the impact of future droughts and new infrastructure, such as rainwater harvesting and desalination plants. Building a city’s water resilience requires holistic and innovative approaches that engage multiple stakeholders, from individuals to governments. These platforms will guide and support the development and implementation of sustainable resilience measures by taking account of local problems and needs. This may require new ways of thinking about urban development; however, demand-driven approaches will reduce cities’ vulnerability and increase their capacity to cope with changes. The IWA, GRP and CWRF approaches are important steps towards creating a global standard for water resilience assessment that informs planning and investment decisions. More is needed than simply improving the performance and efficiency of the component parts of the built environment – change is needed at a system-wide level too. Dr Kala Vairavamoorthy is executive director of the International Water Association. Dr Nathanial Matthews is programme director with the Global Resilience Partnership. Paul Brown is president of Paul Redvers Brown, Inc.